Warm up to some of our specialty fall "woods". Autumn provokes change, and at Decora (and Luxyclad), we want to give you the building products you need to make those changes. Create something new, or add a different finish to an existing product. Sublimation to metal is our thing, and we want to show you what's in this fall with our latest line of specialty tones! Whatever the project, we hope to be your latest inspiration for this season's building trends. Zen Walnut is a rich colour that adds natural integrity to any building or project. Watch the vibrant red tones come to life, especially when paired next to some yellow leaves, or contrasty birch trees. This woodgrain finish will make a naturally beautiful statement that catches the eye immediately. 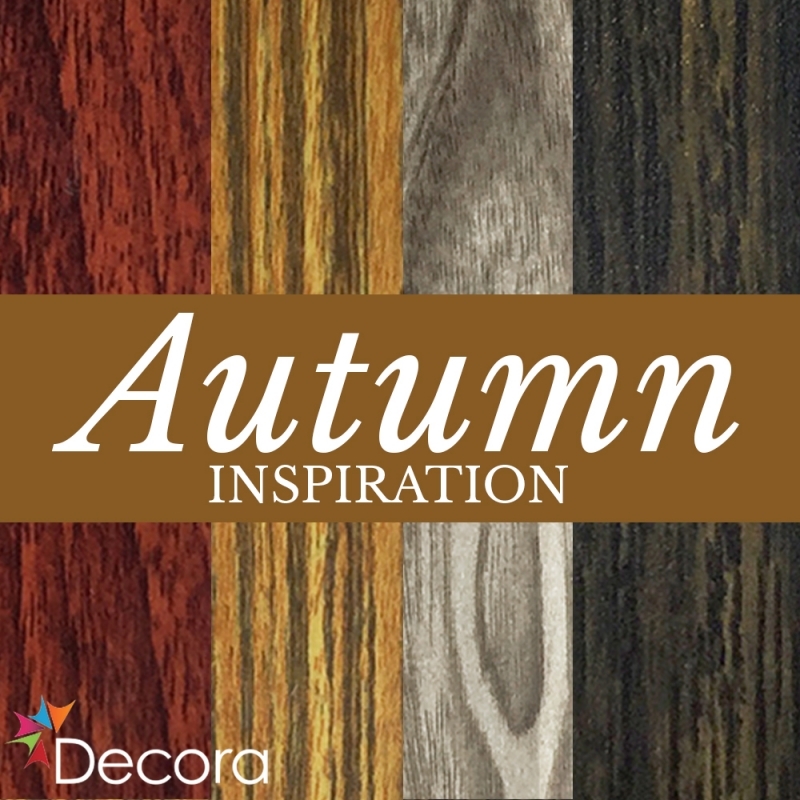 Autumn Oak looks great next to black panelling, as it offers a warm serenity, balanced with luxurious sophistication. The pumpkin spice colours will ease you into comfort, and make any architectural space feel inviting. In the thick of some trees with some long skinny windows, this sublimated woodgrain would make for a great contemporary cottage. Elder Cherry is soft and delicate, and when paired with white - looks very clean and tidy. In the middle of rustic and contemporary, this beautiful grey is a safe neutral that blends fittingly with other colours. Picture this super durable finish on your table or chairs, adding some age and character to your products without sacrificing integrity. Tigers Eye is a dark and moody sublimated "wood" that will keep you feeling grounded or rooted to your home. This is a harmonious pattern when paired with other woodgrains. The orange from our Autumn Oak is sure to lift the lighter colours of Tigers Eye, to keep the warm homely feeling ignited. Add some more logs to the fireplace and change into your best plaid, as this is the perfect fall colour to match your autumn trends. Don't fall behind this fall - stay with the trends or set your own. Matching great aesthetic with durability, our coatings and finishes are built to last; making this the best option for all seasons, including autumn and winter.